After a pleasant train ride in a nice bed in our berth, we arrived in the beautiful city of Gdansk. We visited the tourist office and had lunch at one of the many terraces in the main street. Then we searched our WarmShowers-address. A nice couple in their early thirties, a French guy, Regis and his Polish girlfriend Hanja. They got to know each other through WarmShowers and made a bike topur together in Turkey and Georgia. Now she is pregnant and they're living together in her apartment. Our day in Gdansk was too short. We did not visit everything, but what we saw was really worth while. We wandered through the old town and wondered again about the performance that the Poles have made to rebuild this city, which was totally destroyed in 1945. We visited the town hall with a historical museum and saw pictures of how it was. It is a pleasure to walk around and admire the buildings. Renaissance, Baroque, Dutch Mannerism Gothic, it's all there. The museum "A road to freedom" with the struggles of Lech Walesa and his followers, his decline and later his victory, confronts us with our wealth: a free Europe. We need to be aware of this and to cherish it. 1989 is very recent for us. For our children it may be hard to realize, but freedom can be gone before you know. 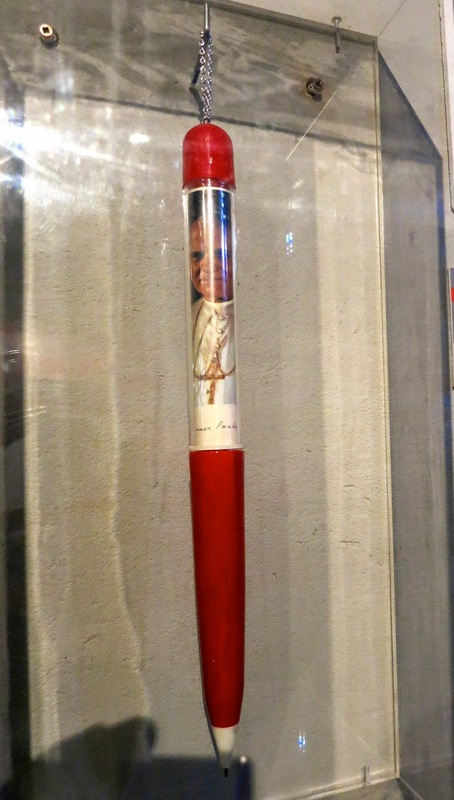 Lech Walesa's monster ballpoint which which he signed the first Solidarnosc-treaty with the communist government.